Lillie Luella Hinshaw1,2,3 [Lillie Louella Hinshaw4]. Clelia Virginia Smoak, born Aug 14 1915, Randolph County, North Carolina. Annie May Ruth Smoak, born Feb 24 1918, Randolph County, North Carolina. Losean Blanche Smoak, born Aug 12 1920, Randolph County, North Carolina. John Henry Smoak, born Apr 24 1923, Randolph County, North Carolina. 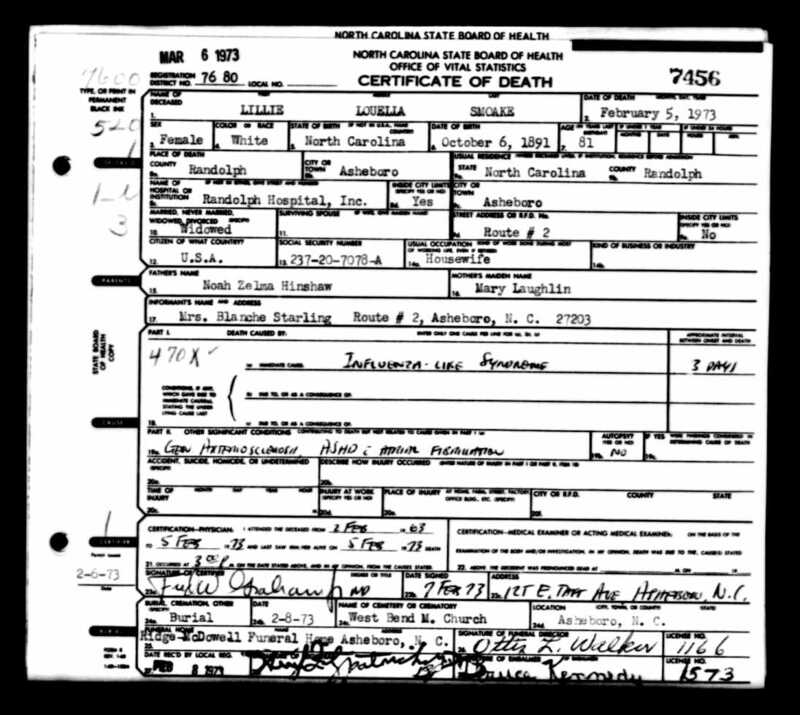 Mary Marinda Smoak, born Jun 15 1924, Randolph County, North Carolina. Dorothy Lee Smoak, born May 13 1928, Randolph County, North Carolina. Margie Louise Smoak, born Apr 27 1931, Randolph County, North Carolina. 1900 census, Franklinsville Township, Randolph County, North Carolina; roll T623-1213, ED 87, page 3A, line #17, dwelling #39, family #41.